I have never been a fan of fingerprint door lock systems but this one looks interesting to say the least, to start with it automatically locks the door after you leave your house – so no worries about that aspect. One point that worries me in this kind of door locks is how easy it might be for a thief to damage the device with a screw driver or any objects that burglars use – is it hard enough or just simple enough? Considering that during the installation part there is only the need to connect one wire to get it to work, the opposite process shouldn’t be too hard unless we count with the alarm system. Anyway, there are 3 types of locks you can pick from with the most important being the fingerprint, the other two are: a PIN security system and a mechanical key which is the only material thing you will have to open the door. Onto the fingerprint features and how it works: there is a master user (consider it your admin password on windows or other OS but in this case it’s a fingerprint) that can setup new accounts for new fingerprints or delete them; the maximum capacity are 100 accounts and each one has a number; last but not least there is also an infrared detector that can sense the finger becoming closer automatically. In case the electricity gets cut down and you can’t get in, there is the chance to use a 9W battery to make the door lock work. It might look pretty good but it since I saw the MythBusters (from the discovery channel) beating a fingerprint security system – I don’t trust this kind of protection. 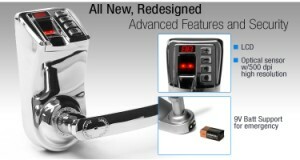 The ADEL Fingerprint Door Lock is available at BrickHouse Security for $199. It would cool if you needed a fingerprint AND a key to use the lock and they operated independently from each other, otherwise I wouldnt trust it.